4.8.2014. 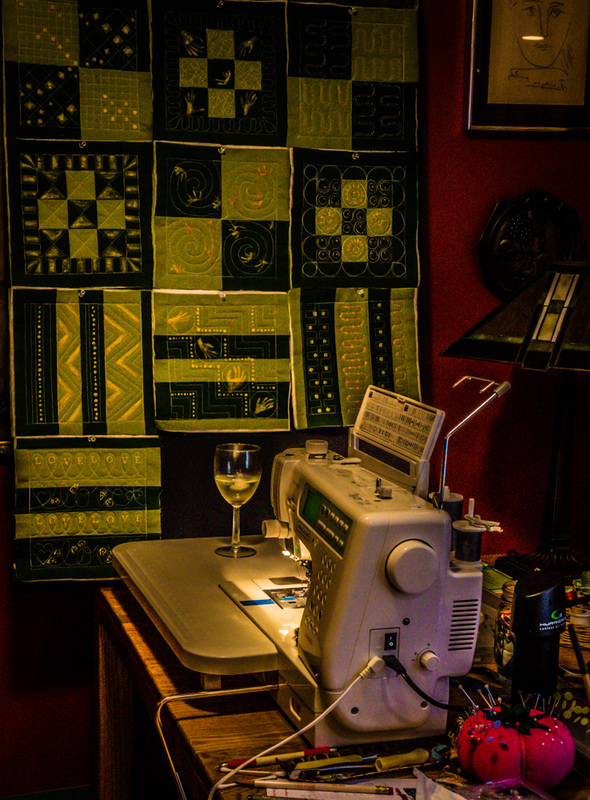 [Cont'd from 3/3/14] Sunday I had to sit down at the machine and catch up with four weeks of free-motion quilting (FMQ) assignments. 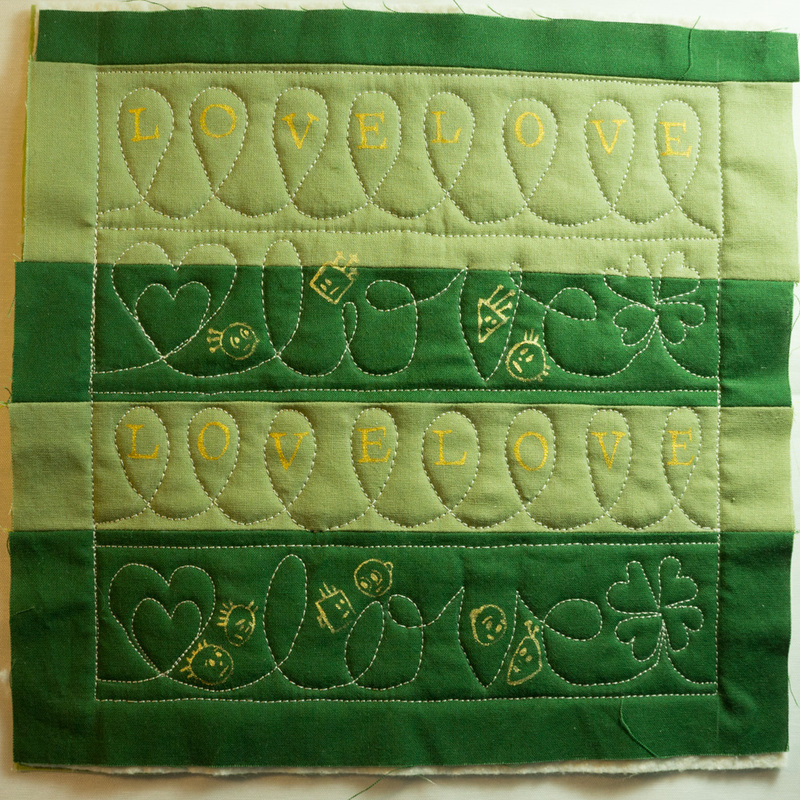 Amazingly, my FMQ (though far from expert) flowed smoothly, with sharp corners, straight lines, easy curves and no loopy "eyelashes" on the back. 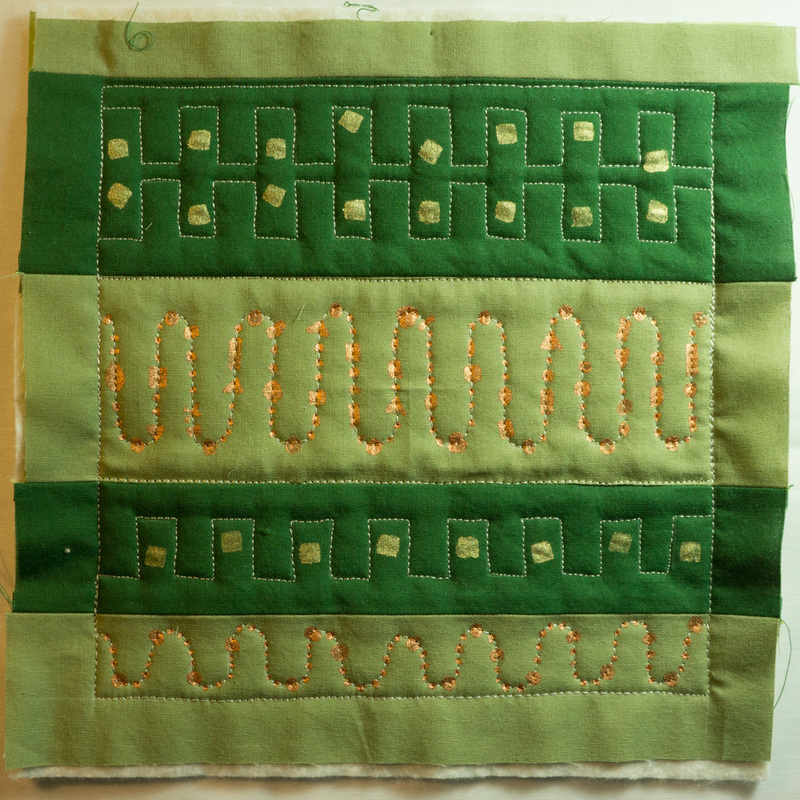 My eyes actually STAYED FOCUSED on the pencil line as I stitched. 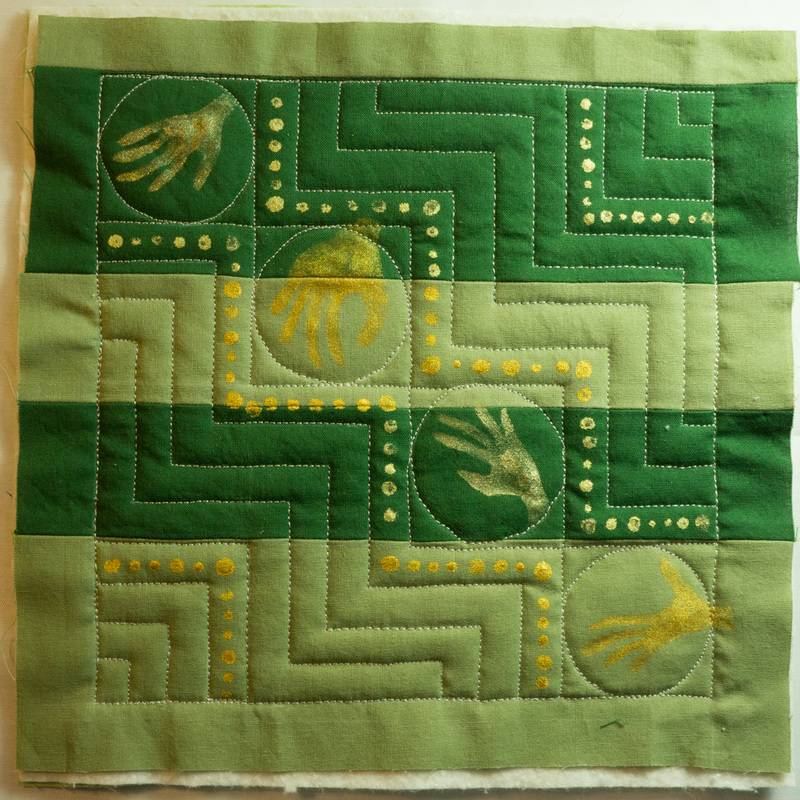 During this month I did a lot of hand-quilting, some free-motion embroidery, and experimented with sashiko embroidery -- can it be that my eyes and hands are actually learning to play together? Have I crossed the threshold from Haywire Novice to Wonky Beginner? Or did I just have a freakishly lucky day? Oh, yeah. Back in February, when I pieced these Rail Fence blocks -- before I graduated from Haywire -- I cut the strips the wrong width. Then I corrected them incorrectly. (Must have been drinking that day.) 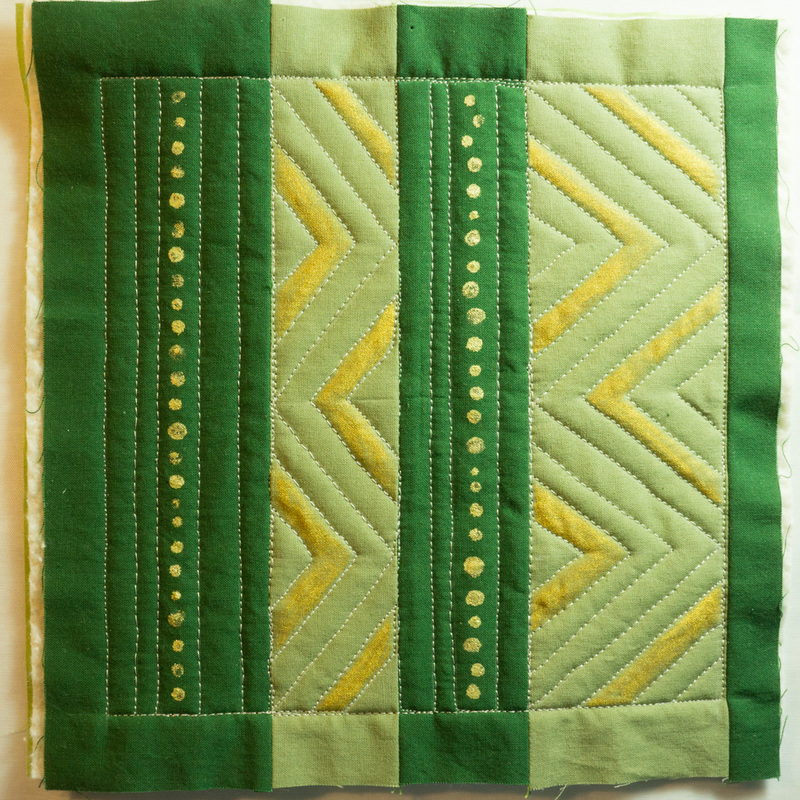 So the layout didn't match the quilting patterns. Time to improvise. No problem, except that I had to undertake some mental geometry to render new versions of the pattern on the fabric instead of letting Jim trace the originals from the paper pattern. But, phew, finally done. And the results show progress. Naturally, I had to gild the lily with Lumiere paints. I'm never sure whether the painting is my muse getting all excited and whispering some more inspiration to me or whether the devil of desperation is shrieking at me to cover up my imperfections. Ha-ha! Guess I won't be able to tell till it's done. Block 3.1. Used cotton swabs for the dots and brush for painted areas. Block 3.2. Used a stencil for the squares. I painted "beads" onto my wiggly lines, but they didn't pop they way I would have liked. Block 3.3. Cotton swabs again for the dots. A stencil made from one of my drawings for the hands. Block 3.4. We quilted the word "love" so I couldn't help painting on some faces of mismatched lovers. "LOVE" in Roman capitals painted freehand, accessing old skills from the 1980s.